Chain Reaction Research, a joint effort between Climate Advisers, Aidenvironment and Profundo published a financial risk assessment report entitled “Tunas Baru Lampung: Contested Land and Peat Clearing Could Drive Substantial Value Loss.” on 14 March 2018. On March 16 2018, TBLA posted its rebuttal on the company’s website. This claim is verifiably incorrect. Chain Reaction Research contacted TBLA on February 16, 2018, and shared with them a draft report for due hearing, as part of our normal process. When no response was received, another email was sent on February 26, 2018, to ensure reception of the report by TBLA. On the 28th of February 2018, Mr. Mulyono Swito, TBLA’s head of sustainability replied with a detailed response. Chain Reaction Research has conducted a sustainability performance review of TBLA and a financial risk assessment, and informed the company and financial institutions of our findings. The company was given opportunity to comment on a draft of our assessment and Chain Reaction Research received a response in writing. Its comments were taken into account prior to publication. Our disclaimer, quoted by TBLA, is standard in any risk assessment report. We stand by our key findings and remain concerned about TBLA’s non-compliance with NDPE sourcing policies and the financial consequences that this can have, on the company, on its investors and its buyers. TBLA owns a company named PT Bangun Nusa Indah Lampung. Our analysis concerned the company with the latter name. Our report has been updated to reflect the correct full name of the company. It is understood that, at least until November 2016, the company had never applied for a conversion of the commodity to be planted as stipulated in the forestland release permits issued by the (then) Ministry of Forestry to TBLA subsidiaries PT Samora Usaha Jaya and PT Dinamika Graha Sarana. These permits issued to the companies specified that their land bank was to be developed into sugar cane plantations. Planting a commodity other than what is stated in the permit is considered a serious breach of Indonesian regulations. Following an inspection in November 2016, the Ministry of Environment and Forestry concluded in a public statement that PT Samora Usaha Jaya and PT Dinamika Graha Sarana had been “disobedient, undisciplined, and violated the authority and trust of the government” when oil palm was planted on land that had been released for sugar cane plantations. The inspection team observed that the larger part of PT SUJ comprised peat, that drainage canals had been constructed, that parts of the peat had burnt and that parts of the land were already planted with oil palm. Chain Reaction Research’s position is that the land would still be contested if it had been planted with sugar cane. Whilst it is technically possible to grow sugarcane on peat, there would be continuous extreme risk of fire outbreak, especially during the initial land clearing and during every subsequent harvest. The scope of Chain Reaction Research’s risk analyses is not limited to legal compliance. Our contested landbank methodology primarily references against compliance with buyers’ and investors’ sustainability (“No Deforestation, No Peat and No Exploitation”) policies. Our reasoning for considering land banks held by various TBLA subsidiaries contested is summarized in the table on pages 3 and 4 in our report. Land titles (HGU) offer some but no final assurance that third party land claims have been addressed. It also offers no security in other sustainability terms, such as standards set by buyers and investors. New government policy and laws can also result in changes in the terms. Nestle Oil Singapore Pte Ltd and A.D.M. International Sari are both listed as counterparties for TBLA’s trade receivables in its 2016 annual report, its Financial Statement 1Q 2017 and its Financial Statement 1H2017. TBLA’s financial report was erroneous because the buyer’s name was corrected to Neste Oil Singapore Pte Ltd in the Consolidated Financial Statements for Q3 2017 report. TBLA reported trade receivables from ADM for 2016, but not for 2017. TBLA features repeatedly on Nestle’s recently published list of supplying mills. Through the intermediary traders AAK, ADM, Bunge, Fuji Oil, Loders Croklaan, Louis Dreyfus, Nutriswiss, Sime Darby and Wilmar, TBLA is present in Nestlé’s supply chain. The supply chain risk identified by CRR is valid because Nestlé has adopted and enforces an NDPE policy. Several of the abovementioned intermediary traders do as well. TBLA also features on ADM’s list of supplying mills. This shows that TBLA continues to feature in ADM’s global supply chain indirectly through 3rd party refiners. ADM also has an NDPE policy. Furthermore, recent supply chain disclosures have revealed that AAK, General Mills, Bunge Loders Croklaan (formerly part of IOI Group), Colgate Palmolive, Mondelez, P&G, Reckitt Benckiser, Mars and Unilever all source TBLA palm oil. Through AAK, TBLA might also feature in the supply chains of Kellogg’s and PepsiCo. All these consumer good companies have adopted NDPE policies that require their suppliers to assure that their supply chains are not associated with deforestation, peatland development and exploitation. TBLA is therefore at greater risk of supply chain exclusion than we had previously assessed. Chain Reaction Research will approach the respective buyers to verify TBLA’s claim. Some buyers may have had current contracts that may not be renewed, or some may have had confidence that TBLA would commit to adhering to their NDPE sourcing policies. We will closely monitor TBLA’s future quarterly and annual reports and verify reports with these buyers. Chain Reaction Research did not claim the clearance falls under the May 2011 Moratorium on Issuance of Location Permits over Peat and Primary Forest. We claim that TBLA subsidiaries continue to clear peat land that was identified by the Peat Restoration Agency (BRG), subject to more recent regulations that apply to peat management inside areas already under permit. The need to revise Government Regulation No.71 year 2014 concerning the Protection and Management of Peat Land Ecosystem, as well as the need to revise Law 18/2013 concerning the Prevention and Eradication of Forest Damage. These revisions need to be conducted so that the regulations may not hinder the development of domestic palm oil industry” (2016 annual report, business outlook, page 97 and 2015 annual report, business outlook, page 91). The reason for TBLA’s opposition to applicable restrictions to peat development is easily understood: the new moratorium has caused a significant portion of TBLA’s land bank to become a stranded asset. 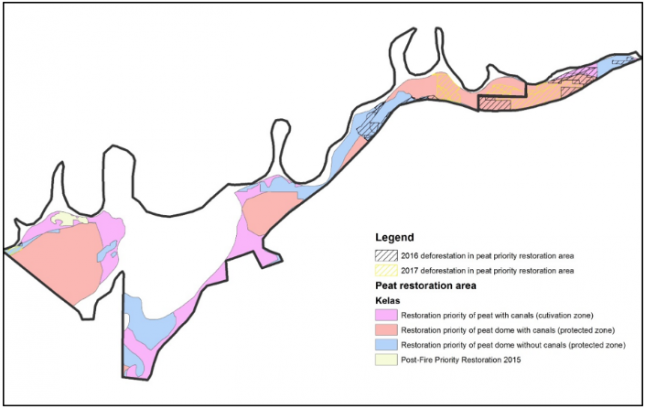 Our map below is based on the indicative peatland map prepared by the Peatland Restoration Agency (BRG), overlaid with the land bank of TBLA subsidiaries PT Solusi Jaya Perkasa (PT SJP) and PT Bumi Perkasa Gemilang (PT BPG) in West Kalimantan. This overlay shows that large parts of these concessions are identified for restoration. It also shows that the TBLA subsidiaries defied the moratorium law and continued to open up 2,170 hectares of new peat in 2016 and 2017. TBLA confirms in its statement that it is indeed servicing domestic “leakage markets”, and with this continues to create sustainability risk. However, many international (food and retail) brands operating in this market also have adopted NDPE policies. We expect that these policies will be increasingly enforced.